First, begin cooking the steak. This is going to be almost like a stewed meat, but we’re going to crisp it right at the end. So, put the steak, with the spices, about 1 cup of water, and 1/2 tablespoon of coconut oil in a large frying pan, turn the heat to about 4 out of 10, and cover the pan. Let this cook for about 25 minutes, then flip it. When you flip the steak, check the water levels. You want the water to be all used up at the end of the next 25 minutes of cooking, but only just at the end. Next we’re going to caramelize the onions, fennel, and mushrooms. If you’re up for it, you can do all the chopping and prep work before you flip the steak. You’ll want to start cooking the mushrooms at just about the same time as you flip the steak. The mushrooms take the longest to cook, so we’re going to start those first. Chop the mushrooms up, put them in a pan with 1 tablespoon of coconut oil, and turn the heat on to medium-low (2.5 out of 10) with a lid. Let this sit for a good 10 minutes, stirring occasionally. Put the broth in a large cook pot and turn the heat on medium low. This should start getting ready at this point. Chop the carrots and half the radishes to similar sizes and add them to the pot. Cover this and let it come to a simmer. If you haven’t already, chop the onions and fennel. These should be coarsely chopped to a similar size as the mushrooms. As the mushrooms are starting to cook down and show some color, around 10 minutes of cooking, add the onions and fennel to the pan. Turn the heat up to about 3.5, and stir regularly, leaving the pan covered in between stirring. Keep stirring regularly until the extra water from the onions and fennel has been used up, and they are starting to show some color as well, then turn the heat back down to 2.5 and keep covered. You may need to add some more coconut oil – so if the onions or fennel are sticking to the pan at all when you stir periodically, add another half tablespoon of coconut oil. Keep stirring and covering until the onions and fennel have turned a nice shade of brown. This should take another 10 minutes or so. Now turn your attention back to the steak. At this point, the water should all have boiled off. If there is water left, drain it, but make sure there is a bit of coconut oil left – you’ll need it! Turn the heat up to a medium-high (about a 7) and crisp each side of the steak. As soon as the steak is done, turn the heat off and attempt to de-bone it. Usually, since we stewed this, the bones should just come right out. If they present some trouble, that’s fine, you can serve this dish with bone-in short ribs and it will still be great! Just remember to serve a bones-platter. Last: slice the remaining radishes, and the chive onions. The radishes can be sliced in large round slices, very thin. The chive onions can be sliced the long way, leaving long noodle-like strips of chive. These will be served over the top of the finished product, like a garnish. Serve the soup first. Ladle the soup in to a bowl and add the short ribs to the soup. Stir this up just the slightest bit, so the steak is a part of the dish. Now, in the middle of the soup, right on top, serve a portion of the caramelized onions, fennel, and mushrooms so that they sit right there in the middle. The person eating will love the presentation. Last: sprinkle the radishes and chives over the top of the soup bowl, getting relatively even distribution. And enjoy! As an after-thought: any leftovers can be combined in a slow cooker for 2-4 hours and cooked down. 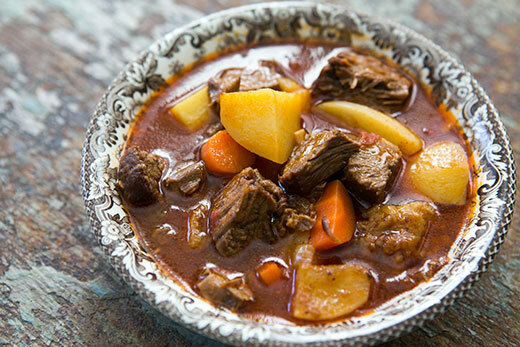 Just add some sweet potatoes around 60 minutes before serving, and you’ll have a delicious stew! Give it a try! Let me know what your thoughts are, which wines you paired this with, and what your alternate vegetable/meat choices were in the comments section! Mmm looks good, I will be trying this out. Thanks for sharing. I am happy to be finding blogs with great tips to help me along. Glad you like it! I really like short-ribs, and look for every chance I get to cook them. They take flavor really well! hey you did the bacon project and was wondering where you bought the global gourmet irish bacon??? Great question! I guess I should be including that… I bought it at Whole Foods, and I have seen it there at least once since then. Making this for supper tonight. My wife just headed out to the grocery now. I will give a report on how it turned out. Excellent! I loved it – and definitely recommend it for anyone looking for a hearty Winter Comfort Food stew! Chef, it was delicious. Another winner!